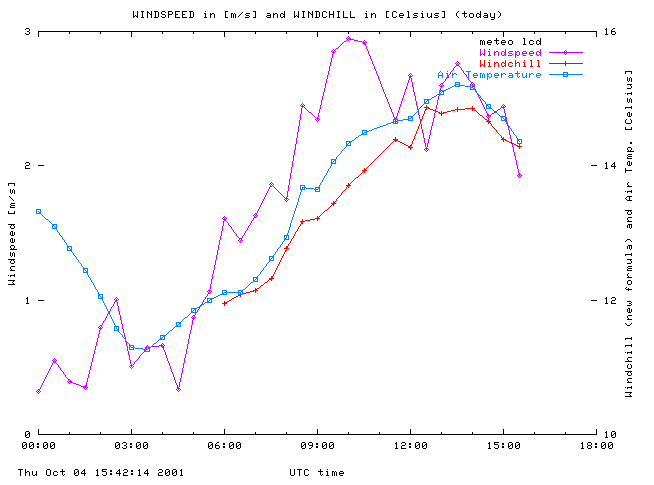 Starting 03 October 2001 meteoLCD computes and displays the windchill together with windspeed and air temperature using the new formula accepted by the meteorological services of Canada and the USA. 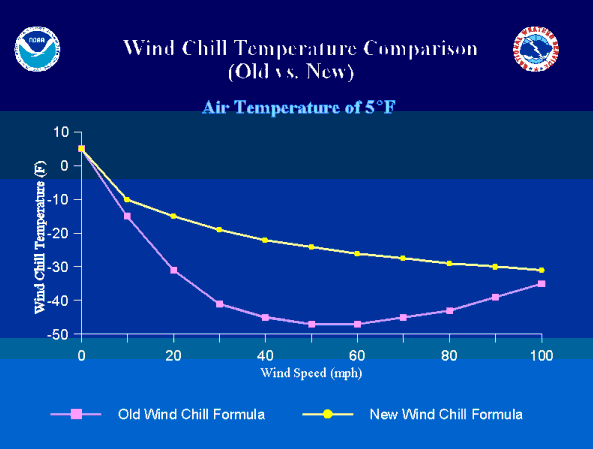 This paper gives some explanation on the old and new formulas, the problems of defining thermal stress levels and the caveats in interpreting the new windchill data. The bare human skin is normally covered by a thin layer of insulating moist air, in which the temperature falls from that on the skin surface down to the lower air temperature (we will exclusively consider this cold weather case). Moving air "blows" away more or less effectively this layer, removing heat from the body more effectively than still air. Increased evaporation of skin moisture (sweat) further lowers down the temperature of the skin surface, which may become noticeably colder than the ambiant air: this skin temperature is what the human body felts, so it sometimes is called the perceived or felt temperature (in German: "gefühlte Temperatur"); the term windchill (in French: "refroidissement éolien") however is commonly used throughout the world for this effect, and is displayed by many meteorological instruments or weatger stations. It is important to know this temperature in cold winter conditions, as the bare unprotected skin may rapidly freeze, develop a frostbite and die off. This can happen in less than 15 minutes under the relatively balmy conditions of -18°C and a wind blowing at 24 km/h. It is obvious, that the WCT is meaningless for V=0; so it should be applied only above a certain threshold windspeed, usually 5 mph (~2.2 m/s). The above index has been in use for over 50 years in many countries of the world, despite the evident fact that the human face is quite different from a plastic cylinder, and that the wind speed at face-level (about 5 feet or 1.5m above ground) certainly is much lower than that on the high standard anemometer mast! So a debate was simmering (or even raging) between the scientific community for many years, wether this WCT really represented the cooled skin temperature, and if recommandations and restrictions taken according to its values were always meaningful. In Germany, a school of scientists around Fanger disagreed nearly completely, and refused to accept the index. Instead, building on Fangers "comfort equation" (in German: "Behaglichkeitsgleichung") Jendritzky et al. developed a complicated model called "Klima-Michel" by calculating the total heat balance of the exposed human body, taking especially into account thermal transfers by radiation. This model than allowed to compute the perceived temperature, used by the German Meteorological Service (Deutscher Wetterdienst). the windspeed used is that on face level, about 5 feet or 1.5m above ground. 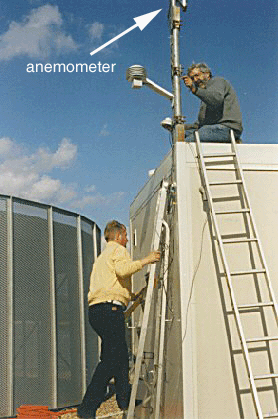 This speed can be obtained (at least approximately) by multiplying that of the 33 feet (=10m) high anemometer by 2/3. Is is astonishing that everybody relied for almost 50 years on a formula which deviates from the newer (assumed scientifically more correct!) by nearly 25 °F ( ~ 14 °C) at an air temperature of 5 °F! 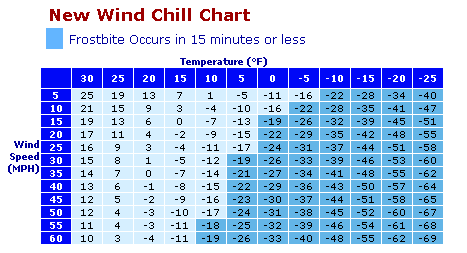 Click here to find a more informative table on wind chill hazards by Environment Canada . This decision required some tweaking of the Gnuplot command files to find an obscure, not well documented command to leave out data points ( test_condition ? function: 0/0 ); the 0/0 does the trick! We hope that this new windchill plot will be of interest during the coming cold winter ( if global warming does not impede on this :-) ...); meteoLCD is the first station here in Luxembourg and probably in the neighbouring region to apply the new windchill formula, which hopefully will become a better accepted standard than the old one. 1. The National Weather Service: National Weather Service plans to Implement a New Wind Chill Temperature Index this Winter. NWS - Des Moines.